Candidates looking for Indian Air Force Meteorology Branch Recruitment 2018 - 2019. Applications are invited for Short Service Commission (SSC) Officer in Air Force in Meteorological Branch for the Courses commencing 2018. Indian Air Force invites applications from Male and Female candidates to join in the Air Force for grant of Short Service Commission / Permanent Service Commission in Meteorological Branch for the course commencing 2019.Feel free to ask questions below in comments. Applications are invited from enterprising & adventurous Indian Citizens ( as per Citizenship Act 1955 for the following courses commencing in July 2018 for grant of Permanent /Short Service Commission in Meteorology Branch. Eligible and Interested candidates apply for the post on or before 2018. Read the complete article and download official notification from the link provided below. Meteorology Branch would continue to serve till the age of superannuation. of ten years. An extension of four years may be granted subject to willingness, service requirements and availability of vacancies. Age limit: Candidates having age between 20-26 Years as on 01 January 2018 i.e born in between 02 July 1992 to 01 July 1998 (both dates inclusive). Allowance, Transport Allowance. In addition, other allowances are applicable based on nature of duty place of posting and would include , Field Area Allowance, Special Compensatory (Hill area) Allowance, Special Force Allowance, Siachin Allowance, Island Special Duty Allowance, Hard Area Allowance and Remote Locality Allowance. On successful completion of Training, the newly Commissioned Flying Officers would be entitled to approximate gross monthly emoluments in Meteorology Branch, including Transport Allowance of major cities,of Rs 66,738/-. Comprehensive Medical Cover for self and dependants, Leave Travel Concession, Leave (60 days Annual and 20 days Casual) subject to service exigency, supply of entitled rations, canteen & Officers’ Mess facilities and many more. Insurance: Rs. 50 Lakh Insurance Cover (on contribution) is applicable to serving officers. TA: Traveling Allowance by the shortest route for AC-III Tier Mail/ Express Trains to and fro for the journey from the place of Call Up or departure (whichever is nearer) is admissible. Change of address, if any, must be intimated to the Board well before your arrival. You shall furnish the railway ticket/ bus ticket (hard copy) to the Board, failing which no TA will be paid. For all other modes of travel, TA will be admissible as per the government authorized rules. No TA is admissible, if you have already appeared for the same type of entry at any of the Selection Boards. (i) Height and Weight: Minimum height :- Men - 157.5 Cms, Women - 152 Cms with correlated weight . of two stages as given below. conducted on subsequent days (Five Days). Request for change of SSB interview date should be avoided. consider change of date at their discretion. It will be conducted at AFCME, New Delhi or IAM, Bengaluru based on the recommendations at AFSB. Candidates recommended by the AFSBs and declared medically fit will be detailed for training in the order of all India Merit list depending on the number of vacancies available. Grant of PC / SSC would be based on number of vacancies, performance in the selection process and the choice given by the candidate. Onus of meeting eligibility criteria rests with the applicant. Merely undergoing AFSB testing would not constitute fulfillment of eligibility requirements. Arunachal Pradesh, Tripura, Nagaland and Mizoram : SEPTEMBER 2018. Candidates are to complete the application as per format given in this advertisement, and forward the same to POST BAG NO. 001, NIRMAN BHAWAN POST OFFICE, NEW DELHI – 110106 by Ordinary post only. NOTE: Candidates who are debarred by the Ministry of Defense from holding any type of commission in Defense Services shall not be eligible to apply and if admitted, their candidature will be cancelled. (b) Two unattested recent color photographs similar to the one pasted on the application form. Serving Air Warrior candidates would be required to apply as per the service format as given in AFO 11 / 2015 through service channel. Other government employees need to apply through proper channel and are to produce NOC at the time of AFSB testing. 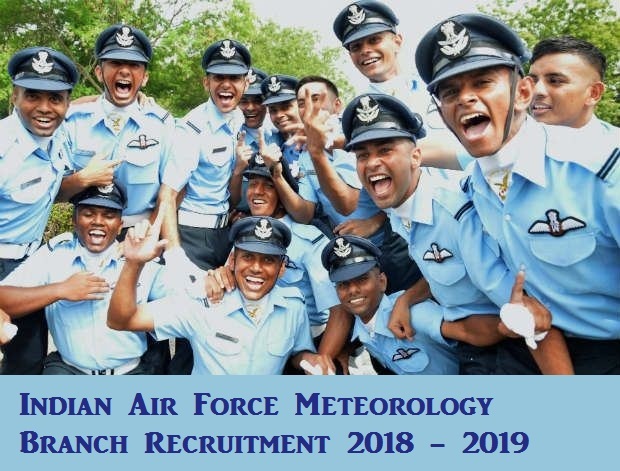 This was all about Indian Air Force Meteorology Branch Recruitment 2018- 2019. Candidates apply online by reading the official notification link given below and apply online from the steps given. For further any details regarding Indian Air Force Meteorology Branch Recruitment 2018 - 2019-8 comment below.